The Dyfrydog Herd is based in the parish of Llandyfrydog near Llannerch-y-medd, the cattle heartland of Anglesey, with the land sloping southwards towards the mountains of Snowdonia. 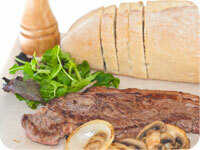 Cut out the middle man and buy fresh local produce that is guaranteed 100% pedigree beef. Unbeatable prices for quality beef. Keep informed of Pedigree Welsh Black Boxed Beef availability by email! Place your order for Welsh Black Boxed Beef now! Founded back in 1971, the Dyfrydog Herd of Welsh Black Cattle was closed to incoming female breeding lines in 1976 and all cow replacements have been from within the herd ever since. This ensures that all animals marketed for beef are fully traceable for over 40 years and all carry the Dyfrydog Herd prefix. 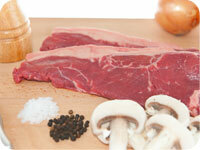 Cut out the middleman and buy fresh local produce that is guaranteed 100% pedigree beef. Unbeatable prices for the very best tasting quality beef. Whole or half sides of Welsh Black beef, cut to customer specification. We aim to please and will try to give customers any special requests in a box, such as larger or smaller roasting joints, extra mince instead, no beef burgers or whatever. No one has asked for less steaks yet! 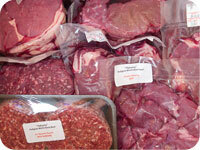 Now available, individual vacuum packs of steaks, roasts, diced/stewing beef, mince and burgers. Take your pick from the freezer! Due to the requests from customers with limited freezer space, we have introduced 5kg Welsh Black Beef Boxes. The 5kg Welsh Black Beef Box will fit into a single draw of a small kitchen freezer. As with the other box options, we will always endeavour to supply any special requests. How Long Will A 10kg Box Last? A 10kg box of Welsh Black Beef should serve a family of 3 adults (or alternatively 2 adults and 2 children) for 13 meals, with cold meat left over after a roast. How Much Does A 10kg Box Cost? This will vary, and be dependant on the national deadweight price for beef paid to farmers, and the cost of processing after leaving the farm gate. It works out at apporximately £8.00 in meat for a family meal. That's not too bad for the very best quality beef! There is also a 5% or 10% discount for half side or whole side orders. Current pricing is £12 per kg. For more details see our Facebook page. Where Can I Buy Welsh Black Boxed Beef? Welsh Black Beef Boxes can be collected from the farm, or delivery can be arranged to Anglesey and the Bangor area with a small charge. Further deliveries up the North Wales coast are by arrangement with a supplement of £5 or £10 per box depending on the distance. Welsh Black Boxed Beef availability by email!